Opening night is coming soon! Rescate’s 20th annual Theatrical Event is from March 24 to 28. Performances are in a marvelous, new indoor location – the Event room at El Mar Restaurant. A new stage has been built that will greatly improve the theatrical experience for our audience. 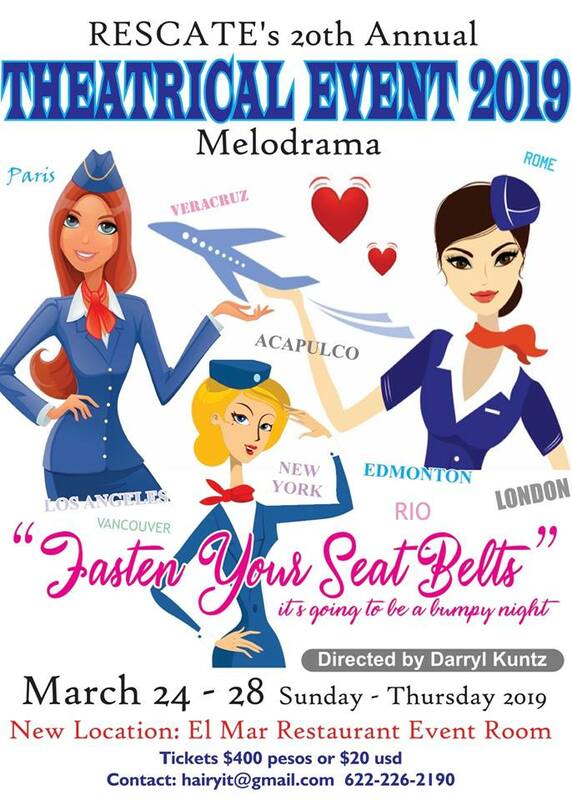 This is the ONLY live theatrical event in our area. 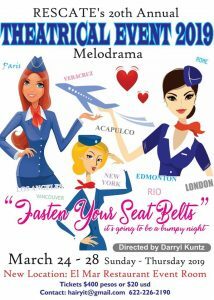 Fasten Your Seat Belts! It’s going to be a bumpy night. There will be complete bar service and popcorn. Tickets cost 400 pesos / $20 USD. There are only 120 seats per night, so get your tickets early. Tickets are now for sale at ReMax, Seaside and Vive realty offices, from the cast and crew and every Saturday at the Rescate Marketplace. 18 and 24 karat Gold Card members – please bring your Gold Card and pick up your tickets at ReMax. If you have questions or need tickets, contact Harriet at 226-2190 or hairyit@gmail.com. Proceeds help support Rescate de San Carlos Ambulance and First Emergency service. 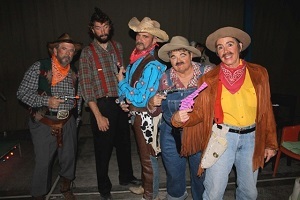 roles in this years production. Production staff needed as well. Do you yearn for the thrill of being in a live production, on stage, performing in front of your friends? Then come to Club Deportivo on Monday, January 7 at 3:00pm to show your stuff. This years production is cuckoo!. No, REALLY, the name is “Cuckoo”! We need your help. It’s always fun and a great way to exercise your brain….Join us and help RESCATE. For more information, contact Harriet at hairyit@gmail.com, 226-2190. 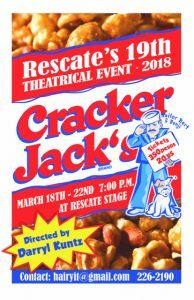 We will be screening the DVD of this year’s Rescate Theatrical Event “Cracker Jack’s” at Dusty’s Deli this Friday, April 6 at 6:00pm. The kitchen and bar will be open for food and drink orders. The cast and crew will be there seeing themselves for the first time. A 50 peso donation to Rescate will be collected. The DVD was filmed in HD with excellent resolution. The menu at Dusty’s is great and the company will be fun. The cast and crew will be there for autographs, photos, etc! Come mix it up with the “mental” cases. Sure to be a fun night. Thank you again to the community for supporting Rescate.